First builds of the month are now ready on Live Builds page. There are some great new features this time around, so let’s take our time unpacking them. One common feature request is to improve quality of fonts in the game. 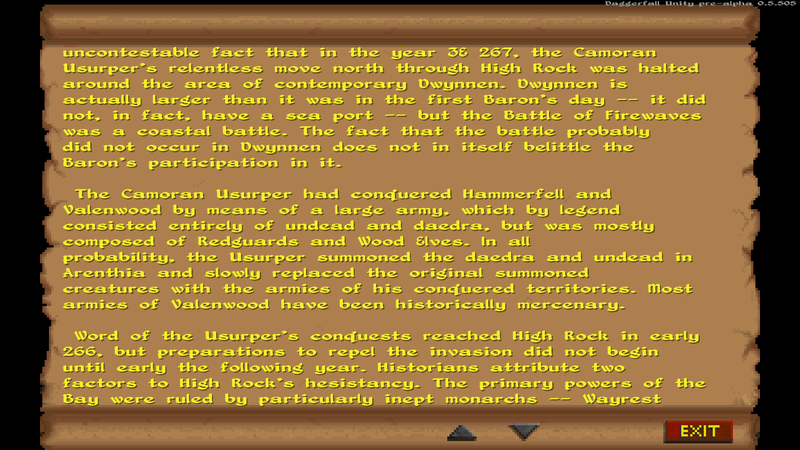 This isn’t a trivial problem to solve as Daggerfall’s text formatting is hard-coded in books, quests, popups, etc. to line-wrap at certain points. There’s a very tight relationship between Daggerfall’s regular pixel font widths and how many characters appear per row. For any font upgrade to fit seamlessly within classic user interface, it must take this into account. My solution was to completely overhaul the way UI renders text and support Signed Distance Field (SDF) fonts in addition to classic pixel fonts. This works by first performing a virtual layout for text elements then rendering either a standard pixel-font character or SDF-font character into the layout using a fast GPU shader. The end result is smooth high-resolution fonts at any resolution that follow the same layout rules. You can toggle SDF font rendering in the startup UI or at any time in game with shortcut Shift+F11. SDF fonts are modable by dropping replacements into the StreamingAssets/Fonts folder. 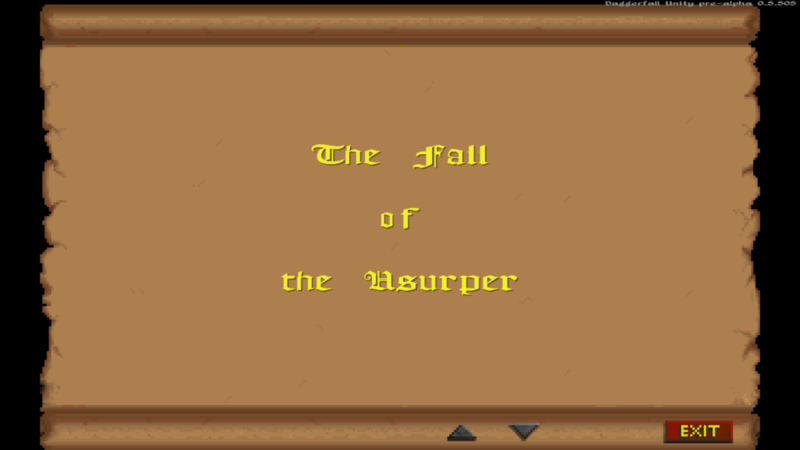 I will post an article dedicated to creating an SDF font atlas suitable for Daggerfall Unity soon. SDF fonts will be visible wherever text appears in the game – with the exception of text that’s “baked in” to UI elements. This needs to be modded out a different way and is unrelated to text rendering. Below are some examples of book text at 4k resolution (click for full size). On the plus side, the other developers have continued to work on systems and fix bugs. I’m particularly excited to see the custom class creator and outdoor swimming in this round of builds, as well as magic item drops for loot and stores. Something that’s hard to describe in point form is all the incremental changes forming the rungs of a ladder towards a fully functional magic system. All of these seemingly minor back-end changes such as potion recipe handling and magic item drops, and magic crafting stations, are all important building blocks towards our goal. I’ve linked the Black Triangles story before, and it’s well worth a read if you haven’t already. It perfectly describes all the work that goes into making the back-end of a game functional while not much interesting is happening on the surface. 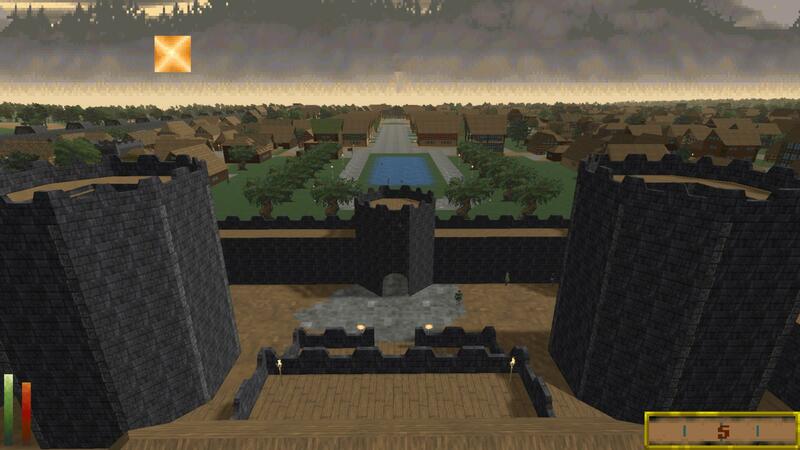 The same is true of Daggerfall Unity as the various moving parts begin to mesh. These are the first round of public builds after upgrading to Unity 2018. There are some general changes in these builds related to updated engine version you should be aware of. For Windows users, the “output_log.txt” file is now in your persistent data path (same place as settings.ini and save games). Please refer to this link to find where your Player log is saved based on OS. The included manual still needs to be updated with this information. For Windows users, you will also see a couple of new files “UnityPlayer.dll” and “UnityCrashHandler32/64.exe”. You can ignore these and just run “DaggerfallUnity.exe” as normal. Improved near death experience (MeteoricDragon) – Introduces a subtle pulsing warning when player is at extremely low health. Can disable from Advanced settings at startup. Magic Item & Potion Maker crafting stations in progress (Hazelnut) – Work has started on these crafting stations and the general UI is now available. They are not yet completed and currently cannot produce magic items or potions. NPCs no longer stop when player’s weapon is drawn (MeteoricDragon). Sorcerers no longer regen spell points, just like classic – recharge now available at Mages Guild (MeteoricDragon). Console command “add [item] [qty]” now supports “add gold [qty]” For example, “add gold 1000” will give player 1000 gold pieces. Console command “reset_assets” will clear mesh and texture caches and refresh scene by performing an in-place quicksave then quickload. This uses the “QuickLoad” slot, so make another save if you don’t want to overwrite this slot. Console command “setmqstage 1” no longer forces player level 1. You can now use this command to restart main quest at any level. Caution this will also reset reputations and global variables. If you’re on the forums, you can discuss this release in this forum thread. 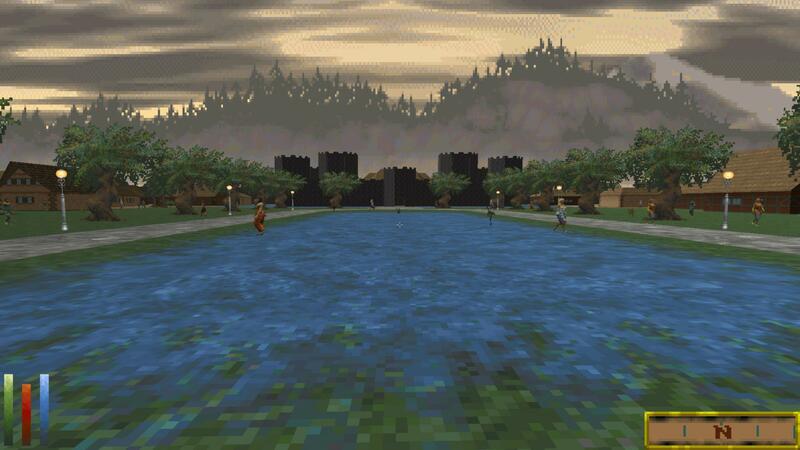 Unlike later games in the series, diseases in Daggerfall are more than a mere annoyance. They mean serious business and could spell a permanent end to your adventures if left untreated. Diseases will sap your attributes to nothing and even kill you in a matter of days if you don’t manage to get cured. So good news everyone! Starting with latest Live Builds you can become infected with diseases in Daggerfall Unity thanks to dirty creatures like bats, rats, and mummies. Diseases actually began development a while back. Most of the research and back-end framework was built out by two rockstar contributors you should already be familiar with: Allofich and Hazelnut. Diseases have just been waiting for me to implement effect system to handle their payload and support their curing by spell effects. 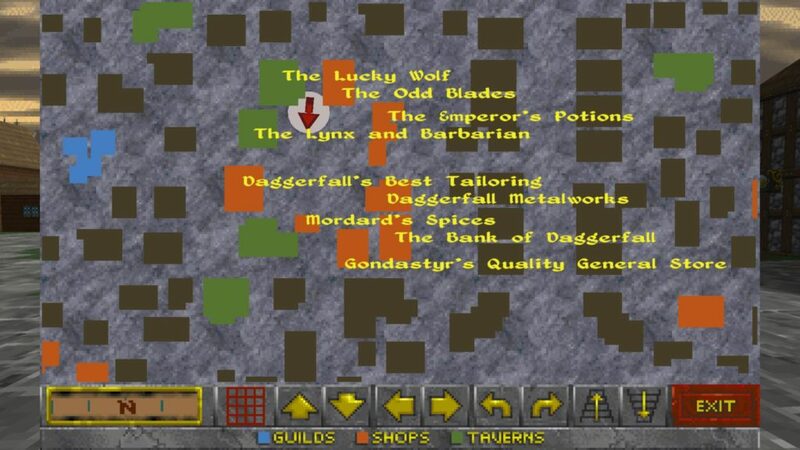 This is another great example of a successful collaborative effort for Daggerfall Unity. Rather than roll out a dry article about implementation details, I’ve decided to use the Visual Diary format to tell a bit of a story and show all the different parts of the disease system in the context of normal play. I’ve decided to create a fictional day in the life of your average character to show how he might catch a disease and find his way to a cure. 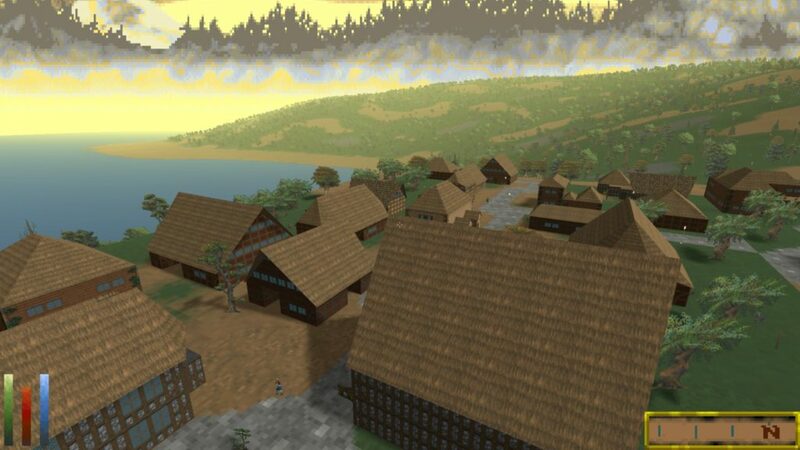 This is also great opportunity to show just how far gameplay has come, as everything that follows is something that could play out in Daggerfall Unity right now. A new round of 0.5 builds are available from Live Builds page. Here’s an overview of what has changed in this version. Spellmaker now shows gold and spell costs. Spells will remain free to buy and cast for testing purposes. Casting spells now deducts spell points from player, but can continue to cast spells at 0 spell points for testing purposes. Crime & Punishment updates with more work on Court UI in progress (Allofich). Implemented Drain Attribute, Paralyze, Levitate effects. Check these Twitter links for short videos of Paralyze and and Levitate in action. Started work on Heal Attribute effects and resistance back-end. Currently only Heal Strength is available, will build more soon. Can now open spell book from character summary UI. Using smaller SoundFont “TimGM6mb.sf2” by default to reduce distribution size. Can now use custom SoundFont by placing .sf2 file in StreamingAssets/SoundFonts and setting SoundFont=filename.sf2 in settings.ini. Active spell effects are now saved/loaded. Allow mods to save/load data (TheLacus). Updated player headbob, smooth crouch, and other movement mechanics (MeteoricDragon). Implement town NPC dialog to include “Where Is > Person” queries (Nystul). Implement spell icons for active spells. Includes tooltips while game is paused. Updates to ensure default materials always have glossiness 0 and metallic 0 and alpha channel available. This is groundwork for using later Unity versions. Attacking civilians with offensive spells is now considered assault. Killing civilians with offensive spells is considered murder. Fix bug with loose file asset injection (TheLacus). Fix bug where player could not delete spells from spell book. Fixes for enemy turning (Allofich). Fix mobile NPCs “skating sideways”. Still some mobile NPC pop-in to resolve. Fix guild membership lost after loading a game (Hazelnut). Fix weather manager causing a crash after loading interior save, and preventing future saves. Fix enemies shooting bow too much (Allofich). Fix %god macro causing a crash in popup dialog. 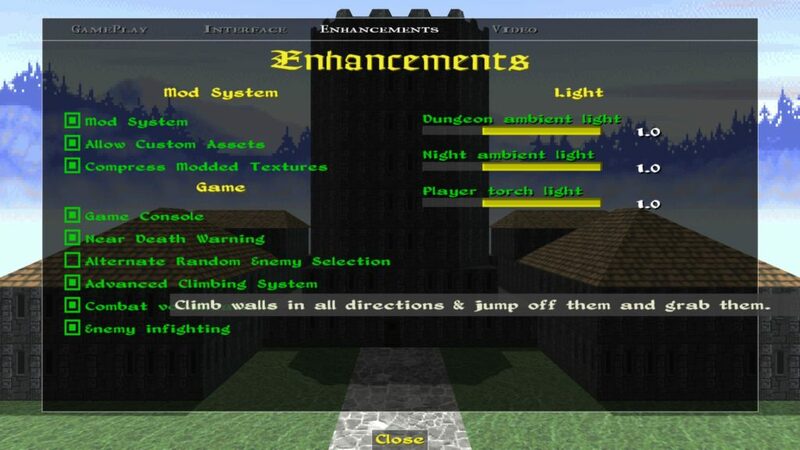 This would become evident when player could not complete quest or rest after bug occurred. Fix certain quest NPC placement tracking to support dialog system. Fix certain town quests starting and ending instantly due to travel time not being calculated (merchant and commoner quests are still in progress). Fix bug where player could melee attack at bow range after changing hands from a bow attack. Fix travel map border not disabling when zooming in.